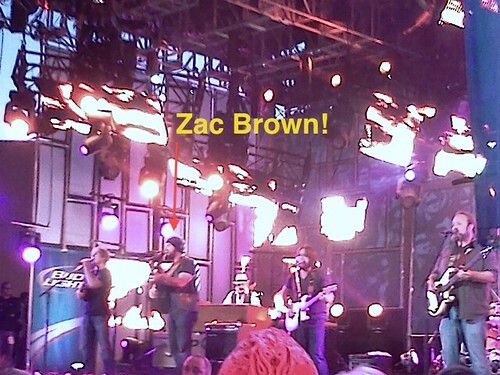 Madeline’s gone Hollywood: Zac Brown Band + Pirates 4! I ran 6 miles this week. I mention that because running 6-8 miles per week is what earned me a spot on the guest list to see the Zac Brown Band play at Jimmy Kimmel Live. I won the contest for the person who ran their best (ie. showed up the most consistently to the tri team group runs). I’m glad the prize wasn’t intended for the person who can run the fastest. I’d never win that because the group’s average running pace is a lot faster than mine. The contest was a great way to motivate people to keep running, no matter their ability. Why am I continuing to run, twice a week now? One reason is that I just signed up to repeat my very first triathlon, Strawberry Fields in the summer. I hope to cut 10 minutes from last year’s time. ZBB fans are some good people. I was backstage before the concert at Jimmy Kimmel Live with a friend. We found a spot on a couch in the back area armed with a small plate of tasty snacks and people kept approaching us to say hi and to strike up conversation which made us feel very welcome. At some point Ginny Goodwin came into our area for a short standup teaser bit on camera before her interview. She looked so adorable, but I couldn’t hear her interview very well from the green room after she went onstage because there were so many people around me busy chatting and mingling. Chris O’Donnell was the other non-musical guest. I didn’t see him in person but a few people around us did. The ship was very finely detailed with lights along the insides of some of the skeletons. 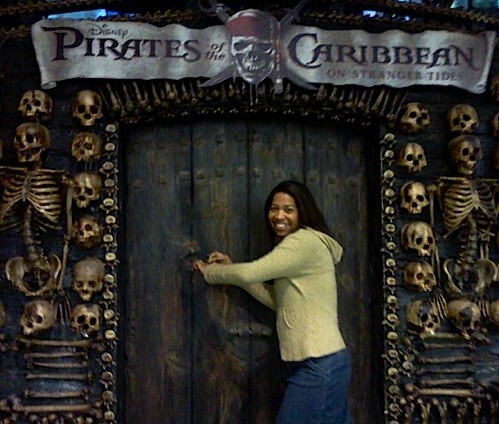 I stood at a non-opening door with working knockers and mugged for the camera. The final part of the night was going to Crumbs Bakery downstairs and trying their cookie dough cupcake. Yum! More photos should be posted on my flickr site this weekend. The next night I saw the movie at a screening on the studio lot! It was fantastic and the cast was great. I do have a couple favorite lines to share but don’t want to spoil anything before the film comes out. I recommend that you see it because it’s a fun, thrilling adventure in true Disney Pirate fashion, plus it’s in 3D. One tip: Make sure you stay through the credits for an extra treat. LA locals, this is for you. Today at Hollywood & Highland complex there’s going to be a Pirate Day party event outside of the Hot Topic store at 4pm. Show up dressed like a pirate and you could see the movie early too.